Boston & Maine Railroad's station and offices on Commercial Street, from 1873 to 1888, seen here as a railroad YMCA in the 1924 Portland tax records. 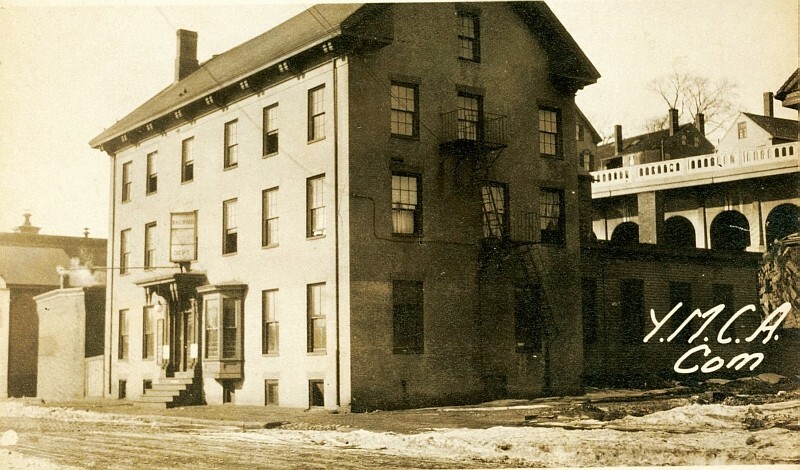 Built as a hotel at the foot of Tyng Street, the Walker House was purchased by the B&M in 1871 when the Eastern RR gained control of the Portland, Saco & Portsmouth Railway. The Eastern leased the PS&P beginning in 1842, and the B&M jointly leased the PS&P starting in 1843; cars would be picked up from both railroads in South Berwick and brought to Portland by the PS&P. The PS&P stopped picking up B&M railcars, so the B&M decided to build its own line. By 1873, the B&M reached Portland and literally cut its way onto the peninsula, the embankment of which is still seen today along Commercial Street. This station was directly across the street from the Eastern station, and was meant to be temporary until the B&M built a station at Maple Street, which was never built, but a freight house was located where Deering Lumber is now. In 1884, the B&M gained control of the Eastern, which became its "Eastern" route. Union Station was built in 1888, where B&M and the Maine Central consolidated passenger service. In 1898, the station was refitted for use as a railroad YMCA, a place for train crews to rest when away from home. The Portland Terminal is listed as the owner. Another railroad YMCA was located at the Grand Trunk Railway's East Deering yard. Added to the photo archive by Tim Sullivan, April 7, 2012.